The Cao Lan are a Tai-speaking ethnic group living in the Midlands of Northern Vietnam. Homegardens are an important component of their agroecosystem. 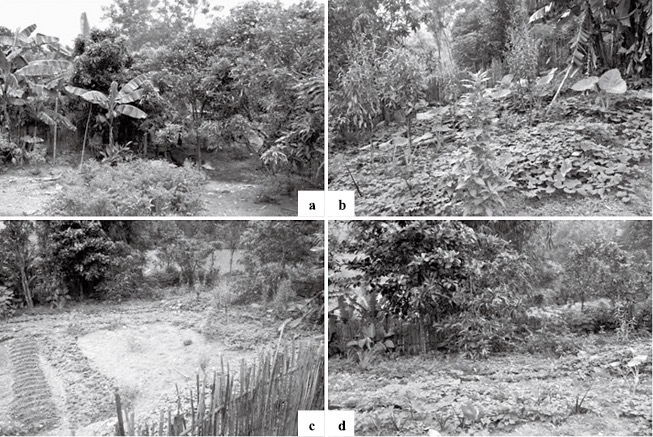 The ecological structures of each homegarden of 17 households of the Cao Ngoi village in Tuyen Quang province were described and modal patterns identified. Most homegardens have organically shaped planting areas with indeterminate boundaries, polycentric planting patterns, and contain multiple species within the same bed or planting area. All of the gardens have multiple vegetation levels, with the largest share having 5 levels and a majority having more than 50% of their planting area covered by overlapping vegetation layers. Biodiversity is high with a total of 113 species recorded. Most plant species are used for food, but smaller numbers have ornamental, medicinal, and construction uses or are used for animal fodder, as stimulants, or for other purposes. Comparison of the modal structure of the Cao Lan homegardens with several Tai minority groups in Northeast Thailand, shows that, although the Cao Lan have been geographically isolated from other Tai groups for many centuries, their homegardens share a similar structural pattern, one commonly referred to as the tropical forest type. This structure is very different from the temperate type gardens of the Kinh in Vietnam with whom the Cao Lan share a common environment and are in frequent contact. The persistence of a common structural pattern among these related Tai ethnic groups, despite their inhabiting different environments, and having had no direct contact with each other for a very long time, suggests that culture exerts a strong influence over agroecosystem structure. After Terra’s pioneering descriptions of the different types of homegardens associated with different ethnic groups in the Indo-Malayan region (Terra 1952–53; 1954; 1958), few additional studies were published about Southeast Asian homegardens until the 1980s when homegardens emerged as a major focus of agroforestry research. Much of this research was concerned with describing the architecture, species composition, and functions of homegardens of different ethnic groups in the tropics. Since that time, a considerable number of studies have been published describing the structure, species diversity, and functions of homegardens of ethnic groups in different Southeast Asian countries, including Burma (Terra 1954), Indonesia (Soemarwoto and Soemarwoto 1984; Wiersum 2006), Laos (Kou et al. 1990; The SUAN Secretariat 1990; Dyg and Saleumsy 2004; Nawata et al. 2009), Thailand (Moreno-Black et al. 1996; Jiragorn and Nantana 1999; Nawata et al. 2009; Thanakorn et al. 2010; Kamonnate et al. 2012), and the Philippines (Snelder 2008). There has also been considerable research on homegardens in Vietnam (Le Trong Cuc et al. 1990; Karyono et al. 1993; Hodel et al. 1999; Dao Trong Hung et al. 2001; Luu Ngoc Trinh et al. 2003; Vlkova et al. 2011) but it has mostly been focused on the Kinh (ethnic Vietnamese), the majority ethnic group. Only a very few studies have been done on the homegardens of ethnic minorities. In the case of the Cao Lan, a Tai speaking minority group living in the Northern Mountain region, there are only 2 brief reports (Gillogly and Nghiem Phuong Tuyen 1992; Le Trong Cuc and Rambo 2001) which describe the species composition of their homegardens but not their ecological structure or the functions of the different species. It was in order to obtain information about the structure and species composition and functions of Cao Lan homegardens, that we carried out a short field study in a Cao Lan community in Tuyen Quang province in Northern Vietnam. This case study was done as part of a larger comparative study of the ecological structures of homegardens of different ethnic groups in Northeast Thailand and Vietnam which was designed to assess the relative importance of culture and environment as determinants of agroecosystem structure (Pijika 2014). The aims of this paper are to describe the modal ecological structure of the Cao Lan homegardens, identify all of the plant species grown in these gardens and categorize their functions, and compare the modal structure of the Cao Lan gardens with those of their Kinh neighbors and ethnically related Tai minority groups in Northeast Thailand. The Cao Lan speak a language belonging to the Tai family of languages. They are one of 54 officially recognized ethnic groups in Vietnam. They are known officially as San Chay (also often called Cao Lan-San Chi). They first immigrated to Vietnam from China beginning in the 1600s. The Cao Lan numbered about 169,000 people in 2009. They are mainly settled in Tuyen Quang, Bac Can, and Thai Nguyen provinces. Settlements of this ethnic group are also scattered in Yen Bai, Vinh Phuc, Phu Tho, Bac Giang, and Quang Ninh provinces (Dang Nghiem Van et al. 2000; Sumitre et al. 2003; Ethnologue: Languages of the World 2013). According to the 1999 census, a few thousand San Chay live in the Central Highlands, mostly in Dac Lac with smaller numbers in Binh Phuoc, Dong Nai, Gia Lai, and Kon Tum provinces (General Statistical Office 2001). It is likely that these people migrated south to the New Economic Zones in the 1980s. According to Gregerson and Edmondson (1998), the Cao Lan-San Chay ethnic group is actually a composite of two groups with two different languages and two non-overlapping cultures. The Cao Lan language has been classified as a Central Tai language of the Kam-Tai sub-branch of the Tai-Kadai language family, while the San Chay language is Han Chinese. In their view “. . . the Cao Lan and San Chay do not live in a classical diglossic situation of high language vs low language, but as two groups with mostly different identities despite a small overlap today and a common link in the past,” when these groups lived in close proximity along the border areas of Hunan, Guangdong, and Guangxi provinces of China (ibid., 152). According to Gregerson and Edmondson’s field study, some Tai speaking Cao Lan groups refer to themselves as San Chay, although this is the official name of the Han-speaking group. Both Cao Lan and San Chay write using Chinese characters. Some older San Chay people can also speak a Tai language just as some elderly Cao Lan can speak and write in the Han language. It can be concluded that, “All these facts tell us that the two were in some sense one nationality with two partially overlapping speech communities whose original bilingualism has developed into separated mostly monolingualism through separation, as the majority of the San Chay live in Quang Ninh and the Cao Lan live mostly in Tuyen Quang, Thai Nguyen, and Bac Giang” (ibid.). Cao Ngoi village is in Dong Loi commune, Son Duong district of Tuyen Quang province. This village is quite isolated and far away from the main road. The distance from the Son Duong district capital to the village is about 50 km, or 2 hours travel by bus (Fig. 1). The narrow and very rough dirt road that connects the village to the main highway crosses paddy fields in lowlands, then climbs up on to the upper terrace with sugarcane fields and acacia tree plantations, before it descends into the narrow valley hidden between steep sloped mountains where Cao Ngoi village is located. According to the oral traditions of the villagers, Cao Ngoi village was established about 200 years ago by a group of 7 Cao Lan households who migrated there from Hoa Binh province. There are now 21 households with 76 people living there. They all speak the Cao Lan language in their daily activities in the village and also can converse in Vietnamese when dealing with outsiders. Traditionally, Cao Lan was written using Chinese characters but now only one older man in the village can read it. Nowadays the villagers wear Vietnamese style clothes for daily life but they still wear the traditional Cao Lan dress on special occasions. The villagers live in the traditional Cao Lan style houses which are built on stilts made from large tree trunks. The bottom of each stilt rests on a large flat stone. Most houses have palm leaf roofs. Some houses have walls and floors made of wooden planks and others have woven bamboo walls and floors. They are entered by a wooden ladder on the side of the house. The space underneath the floor of the house is used to store firewood, agricultural equipment, motorcycles and bicycles, and wooden planks for house repairs. A fire-place made of clay is set on the floor of the house and is used for cooking and heating. The ancestral shrine is mounted on a side wall of the house. Agricultural products such as rice grain and dried maize are stored inside the house. Some houses have large attached balconies built from bamboo where they do laundry and sun-dry food (Fig. 2). The nearest neighboring Cao Lan village is about 4 km away, or 30 minutes by motorcycle, and the nearest market is about 10 km away. The nearest Kinh (ethnic Vietnamese) village is more than 5 km away. A rudimentary 1 room kindergarten in the village has 1 volunteer teacher and 2 very young students. The nearest primary and secondary schools are about 17 km away in Kinh villages. The older children have to ride bicycles to school there early in the morning and return in the afternoon. The trip takes them almost 3 hours each way. Cao Ngoi village is situated at 169 m above sea level at 21°35’40.18’’N, 105°20’52.38’’E. The climate is classified as humid subtropical. The soil is infertile sandy loam, with poor drainage in the mountain valley. Although this area has scattered rain all year round with a mean annual rainfall of 1,500 mm (Nguyen Thi Mui 2006), there is a relatively dry season from August through January and a relatively wet season from February through July. The rains start from late February, with the heaviest rain in July, and then decrease after that with only a slight amount of rain in December. According to the village headman mean temperatures range from 15°C in winter to 35°C in summer. In the village there is a waterfall which the villagers use for electricity generation, for daily household use, to irrigate paddy fields, and which now serves as a tourist attraction in the summer. The agricultural system in the village includes paddy fields, upland fields, homegardens, and livestock. The total area of paddy fields is about 5 ha, with an average area per household of about 1,000 m2. Two rice crops are grown per year with an average yield of about 4 tons of unhusked rice per crop. The fields are irrigated with water from the stream flowing down from the mountainside into the village. Upland field crops are planted under 3 systems: 1) sugarcane on land belonging to the villagers (under contract to the sugar mill), 2) Acacia trees (Acacia mangium Willd) on their own land (under contract to the State Forest Enterprise [SFE]), and 3) Acacia on SFE land (the villagers work as wage laborers for the SFE). The 16 household-owned sugarcane fields cover 8.8 ha. The sugar mill provides the farmers with seedlings and fertilizer. After the harvest, they have to repay the cost of these inputs to the mill. Fourteen hectares, owned by 16 households, are planted with Acacia under contract to the SFE, with the owners receiving 63% of the income at harvest. On the Acacia land owned by the SFE, the villagers who are employed by the SFE receive a regular wage for caring for the trees. Seventeen households have homegardens (an toon in the Cao Lan language). Homegardens include vegetable plots and fruit trees. The gardens surround the houses but are mostly sited in front of the houses. The front side of the house is determined by the location of the ancestor’s shrine. Within the homegarden are the house, animal pens, fish pond, bee hives, fenced vegetable plots, fruit trees, a concrete paved area for sun-drying crops, and an old-style pit toilet located deep in the garden. The average area of homegardens in this village is almost 3 sao or about 1,004 m2 (1 sao = 360 m2, the traditional measurement unit used in the Northern Vietnam region). The 2 smallest homegardens are only 1 sao, 6 gardens are 2 sao, 4 each are 3 and 4 sao, with the largest garden having an area of almost 6 sao (2,000 m2). Livestock include about 60 cattle and buffalo, 100 goats (belonging to 5 households), 300 chickens, Muscovy ducks and geese, and 1 or 2 pigs per household. There are 11 fish ponds belonging to 11 households. Six households have honey bee hives. Cao Ngoi village was selected based on discussions with knowledgeable district officers about Cao Lan settlements that maintained their ethnic traditions and met the following criteria: 1) located in rural area, 2) ethnically homogeneous, and 3) the main purpose of their homegardens was production for household consumption. The village was also selected because it was located some distance away from Kinh villages in a remote area in the mountains, and had no recent connections with other Tai groups in Thailand. Because of the small size of the community, it was not necessary to employ sampling. Instead, all 17 households having homegardens were included in the survey. Data collection was carried out for 12 days during September 2012. Data were collected at two levels: 1) community level information on village history and ethnic identity was collected in semi-structured interviews with the village headman and village elders, 2) household level information was collected in semi-structured interviews with garden owners and by making direct observations of their gardens, including measurement of horizontal and vertical dimensions, and enumeration of plant species. Data were collected on homegarden components, functions of individual species, and structural characteristics (horizontal and vertical). These data were recorded on sketch maps, photographs, architectural drawings, and species checklists. Data on all of the homegardens were entered into an Excel database, which was used to compile tables of characteristics for all gardens of households. Data analysis employed the classification system for describing the characteristics of homegardens developed by Pijika (2014). This system includes horizontal structural dimensions, vertical dimensions, and measurement of species composition and diversity. •	Shape of planting area or plot: Geometric forms include plots or beds with square, rectangular, or circular shapes. Organic forms include planting areas with irregular or curvilinear shapes. •	Definition of boundaries of planting areas or plots: Boundaries can be sharp and clearly marked or indeterminate and ill-defined. •	Arrangement of individual plants within planting areas or beds: Individual plants can be planted in parallel lines (lineal) or in multiple clusters of plants, usually including representatives of two or more species (polycentric). •	Species composition within each plot: Planting areas or beds can be planted with only a single kind of plant species (mono-species) or with a mixture of two or more different species (multi-species). •	Number of levels of vegetation: Plants of different species have different heights, which were recorded for 5 levels: Level 1 = 1 meter or less, Level 2 = 1.01–5 m, Level 3 = 5.01–10 m, Level 4 = 10.01–15 m, Level 5 = >15 m. All plants in the garden may be of the same height (single level) or they may have different heights (two or more levels). •	Canopy overlap: The share of the garden area in which the canopies of plants of different heights overlap each other (non-overlapping, <50% overlapping, >50% overlapping). •	Total number of species growing in the garden. where pi is proportion of the species relative to the total number of plants, and S is the number of species recorded. The frequencies with which different structural characteristics of Cao Lan homegardens occur are shown in Table 1. The modal pattern of Cao Lan homegardens is organic shaped planting areas (Fig. 3a) with indeterminate boundaries (Fig. 3c), polycentric plantings (Fig. 3b) of multiple species in the same bed (Figs. 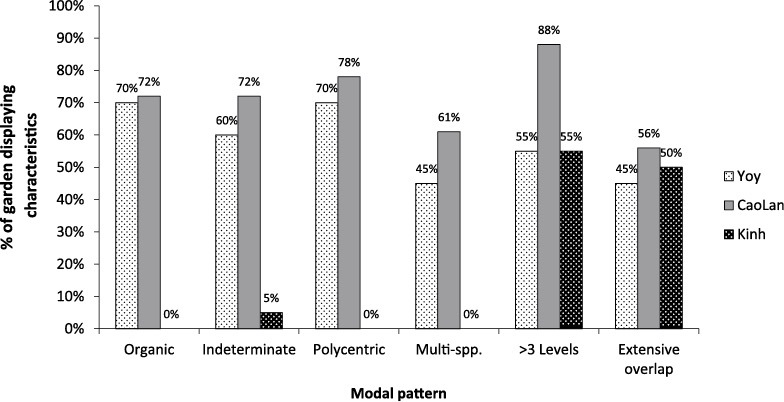 3b and 3d), and having multiple levels (Figs. 3a and 3d) of overlapping canopy layers (Fig. 3a). 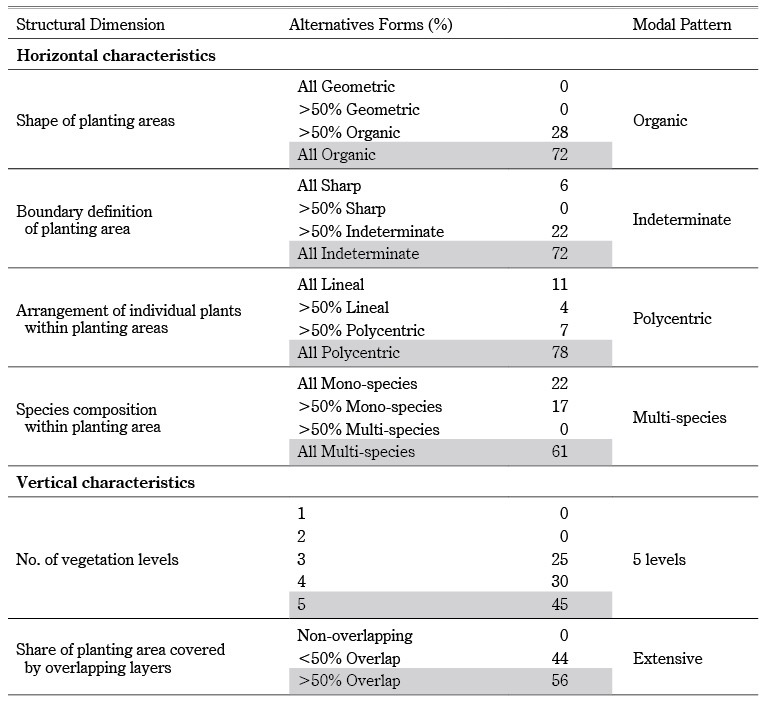 A large majority of homegardens (72%) have an organic shape of their planting area, 72% have an indeterminate boundary, 78% have a polycentric planting pattern, and 61% have multiple species within the same bed or planting area. All gardens have multiple vegetation levels, with the largest share (88%) having 5 levels. More than half (56%) of the gardens have more than 50% of their planting area covered by overlapping vegetation layers. 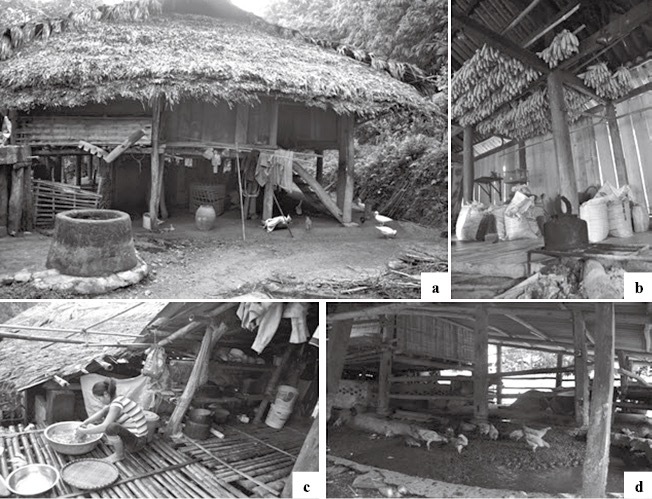 A comparative study by Pijika (2014) of homegarden structures of 8 different ethnic groups in Northeastern Thailand and Central and Northern Vietnam, including 6 Tai groups (Phu Tai, Nyaw, Yoy, Lao, Kalaeng, and Cao Lan) and 2 Mon-Khmer groups (Viet and Kinh), identified 3 distinctive types of garden structures. The homegardens of most of the Tai groups (Kalaeng, Lao, Nyaw, Yoy, and Cao Lan) have structures that resemble the tropical forest type (Nair 2001), which is characterized by having an organic shape, indeterminate boundaries of planting areas, polycentric planting patterns, multi-species composition, multiple vegetation levels, and extensive canopy overlap. The homegardens of both of the Vietnamese groups (Viet and Kinh) have a temperate type structure (Niñez 1984), with geometric shapes, sharp boundaries, lineal planting patterns, mono-species composition, only a few levels of vegetation, and relatively limited canopy overlap. Fig. 4 compares, the modal structural pattern of the homegardens of the Cao Lan of Cao Ngoi village to that of the Yoy, a typical Tai minority group in Northeast Thailand, and the Kinh of Central Vietnam. It shows that the structure of the Cao Lan homegardens is very similar to the tropical forest type structure found among ethnically-related Tai groups in Northeast Thailand, but is very different from the temperate type garden structure of their Kinh neighbors in Vietnam. Different plant species are scattered around in different parts of the gardens so as to optimize to their habitats in the different micro-zones of gardens. The total number of plant species found in all 17 gardens was 113. Table 2 presents a detailed list of all species grouped according to their functions. The mean number of species per garden was 25, with a range from 11 to 46 species. Six gardens had 11–20 species, 6 gardens had 21–30 species, 4 gardens had 31–40 species, and only 1 garden had more than 40 plant species. The most common species are banana (Musa spp.) which was found in 15 gardens, ginger (Zingiber officinale) and taro (Colocasia esculenta Schott.) (14 gardens), guava (Psidium sp.) (13 gardens), Ceylon spinach (Basella albe L.), sweet potato (Ipomoea batatas [L.] Lam) and papaya (Carica papaya) (12 gardens), and Indian red wood (Chukrasia tabularis A. Juss.) (11 gardens). Plant species richness was measured using the Shannon-Wiener’s index (H), in which the higher the index number, the greater the diversity (Table 3). Species richness in the homegardens ranges from H = 1.25–3.04. One homegarden had the highest richness with 35 plant species (H = 3.04). The least rich were 2 gardens with 11 species each (H = 1.25 and 1.36). 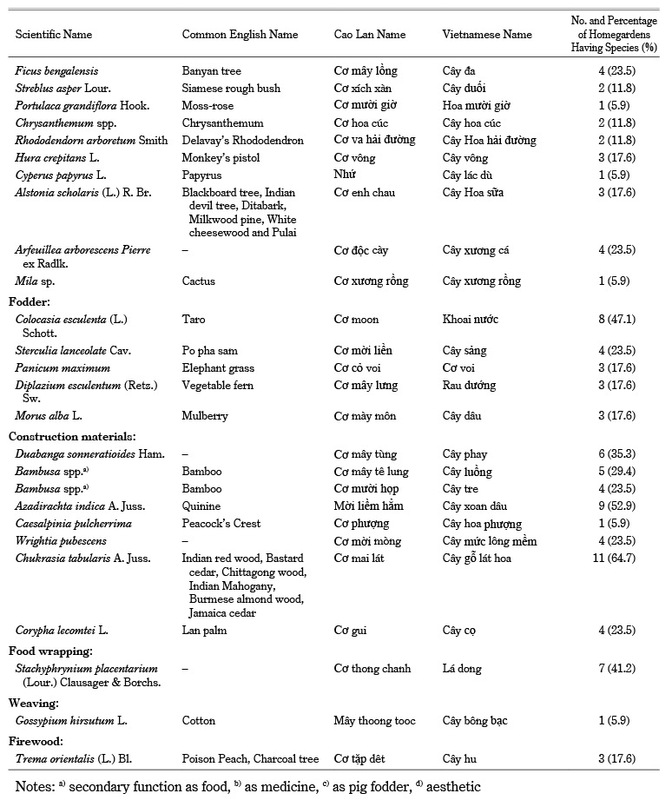 The relative abundance of species was measured using Simpson’s index (D) (Table 3). Forty-seven percent of homegardens have the lowest number of plants for each species ranging from 0.01–0.25, followed by 4 homegardens (23.5%) ranging from 0.51–0.75, and 2 homegardens (11.8%) in the range of 0.26–0.50. Only 3 homegardens (17.7%) have the highest frequency of occurrence of each species. 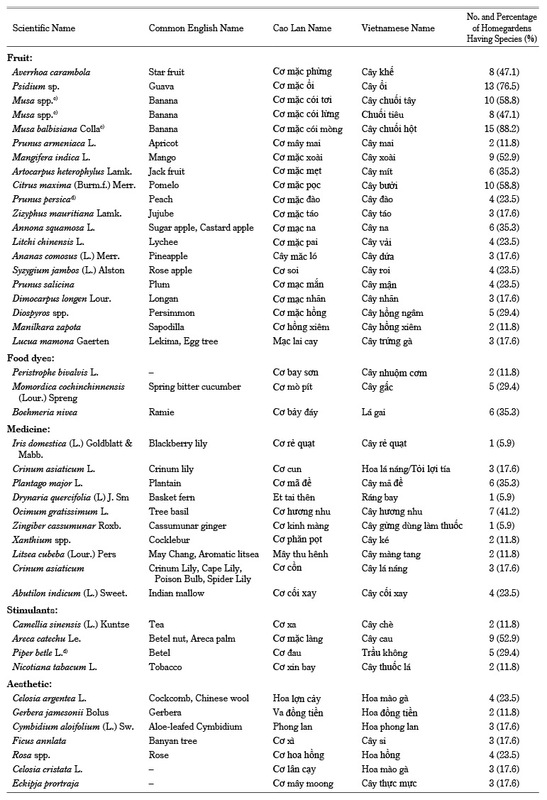 All species were categorized according to their primary use: food and food-related, medicine, aesthetic, stimulants, fodder, construction materials, and other uses (Table 4). 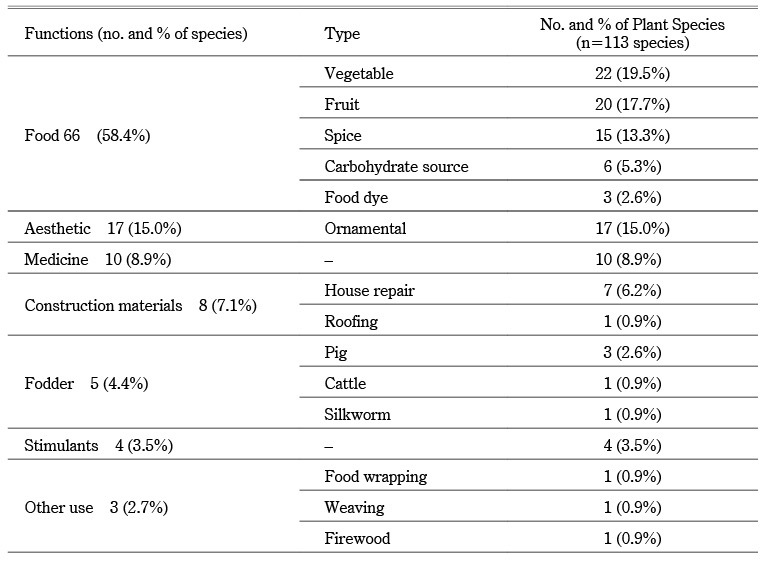 The majority of plant species (58.4%) are used for food, followed by 17 ornamental species (15.0%), 10 medicinal species (8.9%), 8 species for construction (7.1%), 5 species for animal fodder (4.4%), 4 species used as stimulants (3.5%), and 1 species each for other uses including food wrapping, firewood, and weaving. No species are used for ritual or to sell for cash. Only 7 species serve multiple functions: Ginger is used for spice and medicine, the fruit of three species of banana (Musa spp.) are used for human food and the stalks as food for pigs, and bamboo shoots are eaten as human food and the stalks used as construction materials, peach is used for food and serves an aesthetic function, and betel is used as a stimulant and for aesthetic purposes. A small number of species are used as stimulants (areca nut [Areca catechu Le.] and betel leaf [Piper betle L.]), as food dye for cooking sticky-rice cake (spring bitter cucumber [Momordica cochinchinnensis (Lour.) Spreng], ramie [Boehmeria nivea, and Peristrophe bivalvis L.]), and as food-wrapping leaves [Stachyphrynium placentarium (Lour.) Clausager & Borchs.]. Three households have mulberry trees in their gardens, the leaves of which used to be used to feed silkworms that yielded thread that was formerly used to weave cloth and one household grows cotton, which also used to be used for weaving. The homegardens of the Cao Lan of Cao Ngoi village are an important component of their agroecosystem. The many different species of plants grown in these gardens provide food and other necessities for the people as well as fodder for their livestock. With a total of 113 species the gardens also contribute to conservation of biodiversity. Although the Cao Lan of Cao Ngoi village have been geographically isolated from other Tai groups for many centuries, their homegardens display a tropical forest type garden structure that closely resembles that of several Tai groups in Northeast Thailand. This type of homegarden structure is very different from the temperate type structure of the gardens of their Kinh neighbors in Vietnam with whom they share a common environment and are in frequent contact. The persistence of a common structural pattern among these related Tai ethnic groups, despite their inhabiting different environments, and having had no direct contact with each other for a very long time, suggests that culture exerts a very strong influence over agroecosystem structure. This finding provides empirical support for Richard O’Conner’s (1995) earlier suggestion that culture and agriculture are tightly linked together to form durable “agro-cultural complexes” that offer a useful key to reconstruction of the cultural history of Southeast Asia. This paper is part of the first author’s thesis research for a doctoral degree in Systems Agriculture, Graduate School, Khon Kaen University. The research was supported by a fellowship from the Higher Education Research Promotion and National Research University Project of Thailand, Office of the Higher Education Commission (HERP-NRU) which was administered by Sakon Nakhon Rajabhat University. Additional funding was provided by a grant (BRG5680008) from the Thailand Research Fund (TRF) Basic Research Program to the corresponding author. The views expressed in this paper are those of the authors and are not necessarily shared by the Higher Education Commission or TRF. We would like to thank Prof. Fukui Hayao and Assoc. Prof. Suchint Simaraks of the Khon Kaen University Program on System Approaches in Agriculture, and Dr. Jefferson Fox of the East-West Center, for their helpful suggestions about this research. Prof. Tran Duc Vien, President of Vietnam National University of Agriculture (VNUA) helped to arrange our fieldwork in Vietnam and Dr. Nguyen Thi Bich Yen, Deputy Director of the VNUA Center of Agricultural Research and Ecological Studies (CARES) provided logistic support for our field study. We owe a special debt to the Cao Ngoi villagers for the very great cooperation they extended to our research. Dang Nghiem Van; Chu Thai Son; and Luu Hung. 2000. Ethnic Minorities in Vietnam. Ha Noi: The Gioi Publishers. Dao Trong Hung; Tran Chi Trung; and Le Trong Cuc. 2001. Agroecology. In Bright Peaks, Dark Valleys: A Comparative Analysis of Environmental and Social Conditions and Development Trends in Five Communities in Vietnam’s Northern Mountain Region, edited by Le Trong Cuc and A. Terry Rambo, pp. 51–83. Ha Noi: The National Political Publishing House. Dyg, Pernille M.; and Saleumsy Phithayaphone. 2004. Home Gardens in the Lao PDR—Linkages between Agricultural Biodiversity and Food Security. In Proceedings of Symposium on Biodiversity for Food Security: 14 October 2004, Vientiane, Lao PDR, pp. 52–59. Vientiane: Ministry of Agriculture and Forestry of Lao PDR. Ethnologue: Language of the World. 2013. Cao Lan, accessed August 10, 2013, http://www.ethnologue.com/language/mlc. General Statistical Office. 2001. Population and Housing Census Vietnam 1999: Completed Census Results. Hanoi: Nha Xuat ban Thong ke. Gillogly, Kathleen A.; and Nghiem Phuong Tuyen. 1992. Cao Lan Culture and Biodiversity in Historical Context: Environmental Change among an Ethnic Minority of the Midlands of Northern Vietnam. Working paper No. 3. Honolulu: East-West Center, Environment and Policy Institute. Gregerson, Kenneth J.; and Edmondson, Jerold A. 1998. Some Puzzles in Cao Lan. In Proceedings of the International Conference on Tai Studies, pp. 151–163. Accessed March 2, 2013, http://sealang.net/sala/archives/pdf8/gregerson1998puzzles.pdf. Hodel, Urs; Gessler, Monika; Hoang Huu Cai; Vo Van Thoan; Nguyen Thi Van Ha; Nguyen Thi Xuan Thu; and Tran Thi Ba. 1999. In Situ Conservation of Plant Genetic Resources in Home Gardens of Southern Vietnam. Rome: IPRGI. Jiragorn Gajaseni; and Nantana Gajaseni. 1999. Ecological Rationalities of the Traditional Homegarden System in the Chao Phraya Basin, Thailand. Agroforestry Systems 46: 3–23. Kamonnate Srithi; Chusie Trisonthi; Prasit Wangpakapattanawong; Prachaya Srisanga; and Balslev, Henrik. 2012. Plant Diversity in Hmong and Mien Homegardens in Northern Thailand. 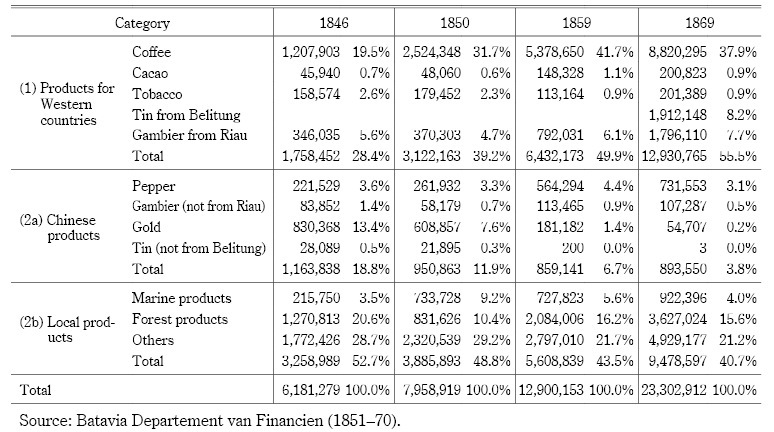 Economic Botany 66(2): 192–206. Karyono; Dinh Xuan Hung; Dao Anh Thu; and Nguyen Duc Minh. 1993. Biological Diversity. In Too Many People, Too Little Land: The Human Ecology of a Wet Rice-Growing Village in the Red River Delta of Vietnam, edited by Le Trong Cuc and A. Terry Rambo, pp. 94–103. Report of the SUAN-EWC-CREC workshop on sustainable rural resources management and biological diversity conservation held in Hanoi and Thai Binh province from 15–26 July 1991, Occasional paper no. 15. Honolulu: East-West Center, Program on Environment. Kou Chansina; Terd Charoenwatana; McArthur, Harold; Bounmy Phonegnotha; and Uehara, Goro. 1990. The Agroecosystem of Ban Semoun. In SUAN Regional Secretariat, Swidden Agroecosystems in Sepone District, Savannakhet Province, Lao PDR, Report of the 1991 SUAN-EAPI-MAF Agroecosystem Research Workshop Savannakhet Province, Lao PDR: 20 June–2 July 1991, pp. 25–43. Khon Kaen: Khon Kaen Press. Le Trong Cuc; and Rambo, A. Terry, eds. 2001. Cao Lan Farmers of the Midlands: A Case Study of the Environmental and Social Conditions in the Ngoc Tan Hamlet, Phu Tho Province, Vietnam. Research report No. 4. Project on monitoring development trends in Vietnam’s Northern mountain region. Ha Noi: Center for Natural Resources Environmental Studies (CRES), Upland working group, Vietnam National University. Le Trong Cuc; Gillogly, Kathleen A.; and Rambo, A.Terry. 1990. Homegardens and Livestock. 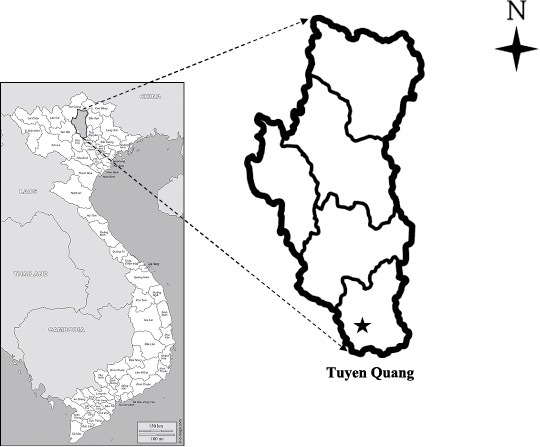 In Agroecosystems of the Midlands of Northern Vietnam: A Report on a Preliminary Human Ecology Field Study of Three Districts in Vinh Phu Province, edited by Le Trong Cuc, Kathleen A. Gillogly, and A. Terry Rambo, pp. 118–151. Occasional paper No. 12. Honolulu: East-West Center, East-West Environment and Policy Institute. Luu Ngoc Trinh; Watson, Jessica W.; Nguyen Thi Ngoc Hue; Nguyen Ngoc De; Nguyen Van Minh; Phan Thi Chu; Sthapit, Bhuwon Ratna; and Eyzaguirre, Pablo B. 2003. Agrobiodiversity Conservation and Development in Vietnamese Home Gardens. Agriculture, Ecosystems and Environment 97: 317–344. Magurran, Anne E. 1988. Ecological Diversity and Its Measurement. London: Croom Helm. Moreno-Black, Geraldine; Prapimporn Somnasang; and Sompong Thamathawan. 1996. Cultivating Continuity and Creating Change: Women’s Home Garden Practices in Northeastern Thailand. Agriculture and Human Values 13(3): 3–11. Nair, P. K. Ramachandran. 2001. Do Tropical Homegardens Elude Science, or Is It the Other Way Around? Agroforestry Systems 53: 239–245. Nawata, Eiji; Uchida, Yukari; and Wada, Yasushi. 2009. Home Gardens. In An Illustrated Eco-history of the Mekong River Basin, edited by Tomoya Akimichi, pp. 29–32. Bangkok: White Lotus. Niñez, Vera K. 1984. Household Gardens: Theoretical Considerations on an Old Survival Strategy. Research Series Report No. 1. Lima: International Potato Center (CIP), Potatoes in Food Systems. O’Conner, Richard. A. 1995. Agriculture Change and Ethnic Succession in Southeast Asian States: A Case for Regional Anthropology. The Journal of Asian Studies 54(4): 968–996. Pijika Timsuksai. 2014. A Comparative Ecological Study of Homegardens of Different Ethnic Groups in the Sakon Nakhon Basin, Northeast Thailand, and Some Related Groups in Vietnam. Doctoral thesis in Systems Agriculture, Graduate School, Khon Kaen University. Snelder, Denyse J. 2008. Smallholder Tree Growing in Philippine Back Yards: Homegarden Characteristics in Different Environmental Settings. In Smallholder Tree Growing for Rural Development and Environmental Services: Lessons from Asia, edited by Denyse J. Snelder and Rodel D. Lasco, pp. 37–74. Netherlands: Springer. Soemarwoto, Otto; and Soemarwoto, Idjah. 1984. The Javanese Rural Ecosystem. In An Introduction to Human Ecology Research on Agricultural Systems in Southeast Asia, edited by A. Terry Rambo and Percy E. Sajise, pp. 254–287. University of Philippines at Los Baños. Sumitre Pitiphat สุมิตร ปิติพัฒน์; Pichet Saiphan พิเชฐ สายพันธ์; Narisa Dejsupa นาริสา เดชสุภา; and Tiemchit Puangsonchit เทียมจิตร์ พ่วงสมจิตร์. 2003. Yai tai lae cao lan: Gloom charttipa tai nai vietnam neui ไย้ ไต และเกาลาน: กลุ่มชาติพันธุ์ไทในเวียดนามเหนือ [Giay, Tay, and Cao Lan: Tai ethnic groups in Northern Vietnam]. Bangkok: Thammasart University Press. Terra, G. J. A. 1958. Farm systems in South-East Asia. Netherlands Journal of Agriculture Science 6(3): 157–182. ―. 1954. Mixed-Garden Horticulture in Java. The Malayan Journal of Tropical Geography 1: 33–43. ―. 1952–53. Some Sociological Aspects of Agriculture in Southeast Asia. Indonesie 6: 297–316, 439–463. The SUAN Secretariat, Farming System Research Project, Khon Kaen University. 1990. Two Upland Agroecosystems in Luang Prabang Province, LAO PDR: A Preliminary Analysis. Report on The SUAN-LAO seminar on rural resources analysis, Vientiane and Luang Prabang, Lao PDR: 4–14 December 1989. Khon Kaen: Khon Kaen Press. Vlkova, Martina; Polesny, Zbynek; Verner, Vladimir; Banout, Jan; Dvorak, Marek; Havlik, Jaroslav; Lojka, Bahdan; Ehl, Petr; and Krausova, Jitka. 2011. Ethnobotanical Knowledge and Agrobiodiversity in Subsistence Farming: Case Study of Home Gardens in Phong My Commune, Central Vietnam. Genetic Resources and Crop Evolution 58: 629–644. doi: 101.1007/s10722-010-9603-3. Wiersum, K. Freerk. 2006. Diversity and Change in Homegarden Cultivation in Indonesia. In Tropical Homegardens: A Time-Tested Example of Sustainable Agroforestry, edited by B. Mohan Kumar and P. K. Ramachandran Nair, pp. 13–24. Netherlands: Springer.